The City of Maebashi lies at the southern base of Mt. Akagi. The clear waters of the Tone River and the Hirose River flow through the city, which is rich in nature and has beautiful scenery throughout the year. Maebashi’s catchphrase is “the City of Water, Greenery and Poetry”, and it is also known as “the Home of Modern Poetry” since it produced a great number of modern poets like Sakutaro Hagiwara. Since it became a city in 1892, Maebashi, the capital of Gunma Prefecture, keeps developing as a center of politics, economy and culture. In 2004, it merged with its three neighboring towns: Ogo-machi, Miyagi-mura and Kasukawa-mura. The Tone River is also known as “Bando Taro (it means it's a major river in the Kanto Plain)” and flows through the western part of the city. It is the second longest river and has the largest basin area in Japan. In early summer you can enjoy fishing ayu (Japanese sweetfish). 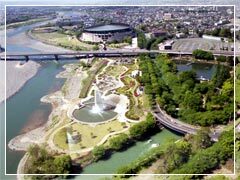 A Water Park is built on the riverbed of the Tone River as a part of Maebashi Park. It has a fountain, a pond and waterfall, and is a relaxing place where people can get close to water. On the banks of the Hirose River, which flows through the center of the city, you can also enjoy taking a walk along the walking trail, exploring seasonal flowers, trees, poetic and historical monuments. The river is beautifully illuminated at night from late autumn through winter. Maebashi can be considered one of the cities with the richest greenery in Japan. You will be surrounded with parks, woods and trees everywhere you go in the city. Places like the Zelkova Boulevard in front of Maebashi Station, Shikishima Park and the Hirose River with its weeping willows are examples of Maebashi's greenery. In Shikishima Park, lots of people visit the Rose Garden where more than 7,000 roses with over 600 varieties grow. The park also has a pine forest with around 2,700 pine trees, a botanical garden and a large green field and you will never get bored spending time there all year round. Since Maebashi was blessed with nature and prospered as a silk city, many modern poets emerged from this liberal background. There were poets such as Sakutaro Hagiwara, who established Japanese free verse, the anarchist poet Kyojiro Hagiwara and Shinkichi Ito, known as a master of contemporary poetry. On the banks of the Hirose River, there is also the Maebashi Museum of Literature, which mainly exhibits works of poets from Maebashi. The city also encourages people to have an interest in poetry by giving the Sakutaro Hagiwara Literary Award to the students who write a great work in the field of contemporary poetry. The “Wanuki” was the commander's banner of Matsudaira, the feudal lord of Maebashi. It was adopted as a city emblem in 1909. The radius ratio of an outside circle and an inner circle is 1 to 0.73.